When I moved into “Little House on the Big Island” in 2008, I was a chain-smoker who drank at least 2 litres of Diet Pepsi every day. I was on six different psychiatric medications. I could swallow a handful of pills dry (and often did, several times a day). I had been erratic about filing taxes for several years and my deepest fear was being caught. I was, at times, cynical and irritable and often caustic in my sense of humour. I’d been through a cumulative 20 years of therapy and still couldn’t understand why I felt so bad. The me who moved out of that apartment was, almost literally, a different person. The moving process was remarkably smooth (though, as with any move, exhausting). My word for the year is “allow,” and my biggest role seemed to be getting myself out of the way so that some kind of flow could come through me—which is exactly what it felt like, that I was being carried along, guided to each next step. Something—it didn’t feel like “me”—was super-organized, labeling and tracking every single box. The self that has trouble even organizing receipts was in awe. That’s not to say there weren’t nights when I woke in a panic about logistics—there were. For the most part, though, there was an immense amount of calm and peace, as though I were being guided to a new chapter, and my only job was to do what was in front of me. Moving, like everything else in my life, became a practice in mindfulness, in paying attention. 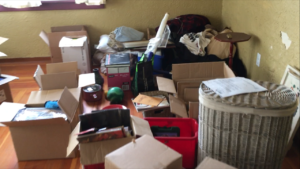 What follows are some of the internal lessons I learned from moving. There are oodles of blogs dedicated to the practicalities, but for me, this was about making this as clean an ending (and beginning) as possible, tying up emotional and energetic loose ends. Eckhart Tolle defines stress as “Being here, but wanting to be there.” I love this definition, because we can only be where we are in any given moment, whether that’s surrounded by empty boxes, or in a room filled with disorganized items, or sleeping on a mattress on the floor. What is, is, and arguing with that just creates suffering. The only times I felt “stressed” were when I forgot that moving is inherently difficult. Moving is at the top of most “life stressors” lists. It’s a massive change, an uprooting of one of our most fundamental securities (shelter). Expecting it to be just like any other day—whether by resisting all the tasks, or resisting change itself—creates exponentially more discomfort. 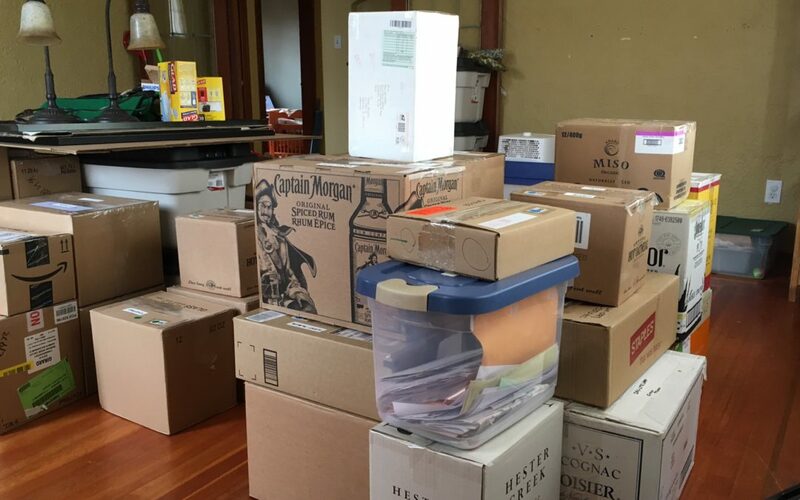 Moving also requires a huge coordination of logistics—an area that is not my strong suit. I broke everything down into lists of baby steps, and then I broke the baby steps down into even smaller tasks (fetal steps?). With those lists, I focused deeply on each task as I was doing it. There was some kind of grace, in that my mind didn’t wander too much to all the other steps that need to be completed. I just focused on packing this box; wrapping these plates; organizing these items to be donated; asking that neighbour for a ride to the dump. This might sound like “more mindful than thou” but I don’t mean it that way. It was simply how I kept my sanity. I divided the living room into four sections: Sell, Donate, Dump and Keep. I knew my storage unit was 5′ x 10′, which meant I’d have to be very selective in what I kept. Then I started going through the basement. The “Donate” pile eventually took up a full quarter of the living room. I released books about my family’s genealogy, a workbook for a pilot PTSD program I was enrolled in a decade ago, source material for GDAT (do I really need a Y2K-era tourist brochure from Singapore? ), three Rubbermaid bins of photos…and so much more. My old television demo reels went to the dump, while music-industry memorabilia went to a documentary on 1990s Canadian music. I had a few antique sports items that had belonged to my father, and I donated those, too. Several people have said they wouldn’t be able to part with family heirlooms, yet the way I see it, my father isn’t in those items. He’s in my heart. What am I going to do with a 1920s catcher’s mitt? With each item, I held it and listened for an internal nudge. Only if something produced a strong “Yes!” did it stay in the Keep pile. A few times, the inner voice said, “Maybe?” and so I set it aside until the answer became clearer. I’ve never read The Life-changing Magic of Tidying Up because truthfully, I’m not a very tidy person. But I’ve read enough about the book to understand that it involves thanking every item I discard. So I did. Every single one. From each photo to old workout gloves to a laundry hamper. I’m not interested in being “more minimalist than thou.” Life has guided me to a fair amount of simplicity, and over the years, I’ve discovered how much I could live without, yet I don’t see myself as someone who embodies “simple living.” I’m a big fan of comfort, when possible. When I moved from Manhattan to Toronto in 1994, I took the train. I had a hockey bag of clothes, and I shipped about eight boxes, mostly books and childhood mementos. I started over. In 2005, when I moved from Toronto to Vancouver, I had to do so in a period of two weeks, and I couldn’t afford to ship all the ‘grownup’ furniture (couches, coffee and end tables, etc.) I’d so carefully chosen. I have yet to replace many of those items. So if you’re in your 20s, and your main piece of furniture is an Ikea futon, by all means, give it all away! But if you have items you truly love, I recommend discernment. It takes time and money to rebuild. In looking at my office, I realized how much it was furnished around the idea of what a professional writer’s office should look like, rather than how I actually work. Yes, I need a home office, but it doesn’t need all this stuff. First, there was the bookshelf. How many of those books had I actually re-read over the past nine years? As gorgeous as it was—solid wood and nearly six feet tall—it stood more as an ego sign of “Hey, look how smart and writerly I am!” than serving a practical purpose. I donated all but one box of books—which would have been sacrilege to old-Sarah—to a local literacy group. I had a one-of-a-kind “character” desk, a solid-wood, hand-built drafting table that I loved as much as any furniture I’ve ever had. But I hadn’t actually used it as a desk in seven years, except as a place to put papers (did I mention I’m not particularly tidy?). When I’m working on the laptop, I sit on a futon with my feet on an ottoman. The desk was also far too big for my storage unit. I thanked it and (with a fair bit of sadness) sold it. And the filing cabinet? Also elegant and solid wood, but how much paper do I keep these days? I bought it after a print-heavy series of projects in 2010, but since then, it’s largely been—can you guess?—a bit of a dumping ground. I liked the idea of being someone who had a filing cabinet more than I actually needed a filing cabinet. I’m extremely grateful that I had enough time to say a proper goodbye to the apartment where so much transformation had occurred. Because my landlords were renovating, I wasn’t required to do a full “move-out” clean (whew!). Yet I decided to wipe down the baseboards of each room by hand, and as I did so, I mentally reviewed the significant events that had happened in that room. 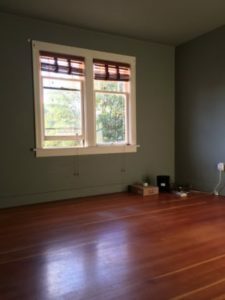 I thanked each room for its role in my life, and (inspired by a Danielle LaPorte blog post) I called back any of my energy that still lingered, so that when I left, I would be whole, with no residual energy stuck in my former home. I miss LHBI, and perhaps I always will. It was a beautiful, bright apartment on the main floor of a 1935 cottage, and it felt like home more than any place I’ve ever lived. But as I said before, I was only a steward—even when we own houses, we’re only stewards—and by the time my actual move date arrived, I felt that I had as much closure as it was possible to attain. It might not have been my first choice, but I was ready to move forward. What a perfectly fabulous piece. Love it. Love it. Love it. Things for me to think about even though I am not moving, but still needing to simplify and feel lighter.